We decided to make a couple of adjustments to Ryan's template. We replaced the shapes for the "faces" with generic images in order to make it slightly easier for her 3rd graders to use the "Replace Image" option rather than resizing inserted images. And we made the landscape image, which is like the header, a gray image, again for easier replacement. Here's where it gets cool! 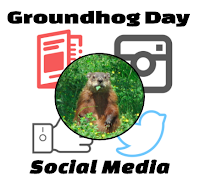 These little "tweaks" allowed the students to focus less on the nuances of image sizing and more on critical thinking about who/what would "follow" their groundhog. The creativity of these 3rd graders to decide who would follow a groundhog? How do you come up with a Twitter handle for a groundhog - let alone his 3 followers? And the little blurb for the bio? Wow! I was a little stumped when I started to think about it ... but they came through! Ryan has several other templates that I have to take a second to share out. Please, please, please visit his site to see these amazing templates! Harry Potter's "The Daily Prophet" - literally has a moving image of Hagrid and a video of Dumbledore and even the right color for the background of this newspaper. Time magazine - at first, I thought it was just the front cover (which is amazing on it's own) but then I opened the template and it's a replication of the magazine. My thought = class report or possibly class newsletter? My Summer by the Numbers infographic - such a cool way to wrap up a school year or a holiday break. Finally - Beth did this and so can you! You CAN use social media (templates) to inspire creativity in your classroom and have fun doing it. Ryan noted he'd love to see results of teachers using these templates in their room, so if you've been inspired and choose to use one of his templates, PLEASE tag him (@creativeedtech) and me as well (@kiefersj). I'd love to see them, too!